12. But Is It Art? 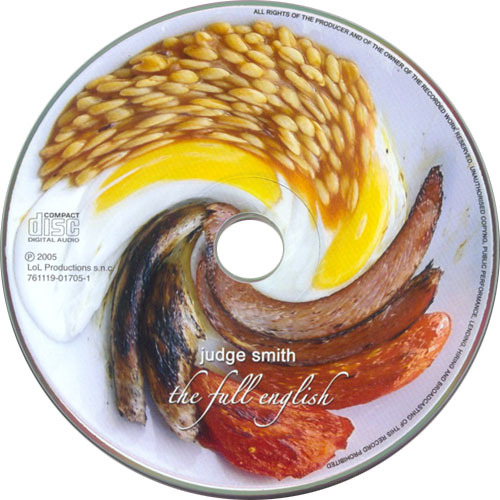 In an interview several years ago, Peter Hammill called Judge Smith one of the world's undiscovered geniuses. 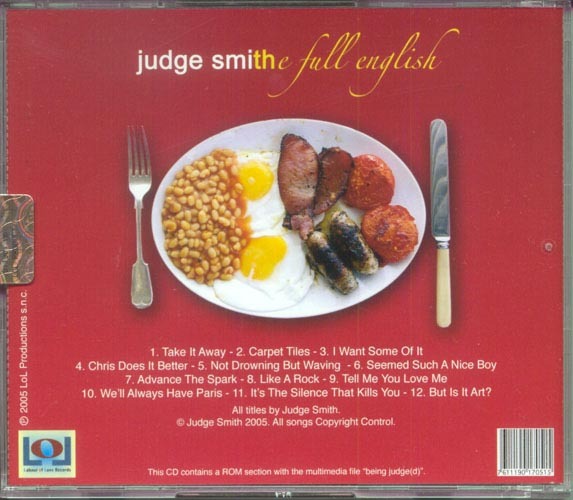 Judge's new album, The Full English, goes a long way toward reinforcing this view. In one way, The Full English is at the other end of the spectrum inhabited by Curly's Airships. The new album is a (much) shorter collection of songs than the "song story" opus Judge released a few years ago. Both, however, share his unique and often brilliant take on characterization, as well as his gift for composing catchy, deceptively simple melodies with seemingly natural ease. Listening to the new CD, one is immediately struck by several things. First, the clarity of sound is astonishing; Marco Olivotto comes through with a wonderful production job and The Full English is imbued with a warm, rich vibe throughout. Some of this can be attributed to the arrangements. Judge consciously set out to record a more stripped down, acoustic oriented album. The unique instrumentation (guitar, keyboard, percussion) adds immeasurably to the charm of the songs in a way that a full-on "rock band" would be hard pressed to deliver. And there are the songs themselves. Judge has a talent for creating melodies and hooks that ingratiate themselves into the listener's consciousness for days after hearing them. The songs are catchy, but they're also good so one doesn't mind them taking up residency in one's head for sometime after listening to them. Lyrically, Judge is often given points for the humorous storylines and characters he concocts. Rightly so, as it is pretty difficult to not smile while listening to much of his work. But there is also an acute comprehension of human nature at work here. Whether it be the alluring stories he offers such as "Carpet Tiles" (where a couple start up a business before plans go awry) and "We'll Always Have Paris" (which presents a lover anguishing over the end of an adulterous tryst), or the multiple characters he renders who merely have the title of a song in common ("Not Drowning, But Waving", "Seemed Such a Nice Boy"), he displays a depth of understanding about life's various situations and the players that partake. These are not merely cardboard cutout characters trotted out for the purpose of a punch line. Judge brings them to life and gives them complexity even in the context of short character sketches. The Full English delivers on all fronts: production, performance, and composition (both musically and lyrically). A basically cheerful person himself, Judge probably has a positive outlook on life and the world around him. But if there is any justice, then he shouldn't have to remain an "undiscovered genius" forever. JC: You wrote in the liner notes to the new CD that its genesis sort of goes back to a show you did supporting Arthur Brown that was attended by a group of Judge Smith fans. JS: Yes, absolutely. I think of myself as a rock writer, of sorts. I don't come from the folk end at all really, so performing live has always been, for me, singing with a band - bass and drums, a proper band. But Arthur asked me to open up for him at this acoustic gig he was doing. He sort of challenged me: "You've always said that it's a shame you're not singing more. Okay, you can come sing for me." He introduced me to a guy he'd played with, a guitarist named Rikki Patten, and Rikki learned some of my numbers and we performed them, just the two of us. Because of the novelty value - Judge actually performing - Sean Kelly, David Scoffield, and Peter Ostrowski came down for that gig. Afterwards they told me, "You should do more, we enjoyed it." So then they asked me if I'd heard of the English Chanson movement, and I said, "The what?" It appears that there's this small network of clubs which trade under the banner of "English Chanson". David took me to some of these places, and I began to see that it was possible to do some of my material in that context - a semi-cabaret performance with small scale, acoustic backing. So that was the beginning of it. I did a gig at an English Chanson club called Pirate Jenny's in London and, as a result of that, I was seen by an artist called Rob Johnson. He runs a label called Irregular Records and said, "Well look, if you'd like to make an album I'll put it out." So, that's what started the album off. JC: Can you talk about the musicians involved? JS: When I started preparing to make the record, I wanted to find local musicians in the Brighton area to work with because that would be easier, particularly if there were to be any gigs. I spent quite a lot of time trying to find musicians who would be right for what I wanted to do, but it didn't work out. I was mentioning my troubles to John Ellis, and he said, "Oh well, you know... I'd play for you." So I bowed to the inevitable and said, "Yes, that would be great!" I thought, "Why should I be looking elsewhere when I've got this great guitarist willing to play for me?" JC: Then there's the keyboard player, Michael Ward-Bergeman. JS: I'd decided that I wanted to do it with keyboards and guitar; that would be the basic lineup, and surprisingly you don't often have just a keyboard player and a guitarist. It's not that common, even for things like cabaret, chanson, or stripped-down acoustic stuff - but I think it has a lot of possibilities. Anyway, John introduced me to Michael Ward-Bergeman, an American who studied at Berklee School of Music. He's a classically trained musician, but he became very keen on the accordion, and he had a life-changing experience when he had a five hour lesson with the lead accordionist of the Taraf de Haidouks. Anyway, Michael and John were already friends and had several music projects going of their own. So they were already a musical partnership and it was a joy working with them. JC: So then there's René van Commenée. JS: René's a big Van der Graaf Generator fan and has played percussion with David Jackson. I got to know him when he played tabla on the Indian music sections of Curly's Airships. When I realized that it would be nice to have a couple of tracks with drums and a couple of tracks with percussion, he volunteered to do it. So it all fell into place. I went over to Holland to record his parts. JC: Yeah, I was going to ask you about that. The lyrics to the last song on the CD, "But is it Art? ", actually make it sound like people did their stuff separately: René in Holland and Michael fifty miles away from you, he did his stuff in London. JS: I sent René songs on CD without percussion. Then I went over there, we talked them over and tried different things out, and we recorded his parts. You can do this now with computerized recording. It's so much easier, moving about from place to place. Because of the nature of the album, I didn't want to do programmed drums or programmed percussion. It was just unsuitable for this project. René was able to do the stuff live for me, which was great. He's a percussionist, but he hasn't really played drums since the seventies. He said, "I'm not a drummer but I'll try to play these tracks for you." What was interesting, and he agrees with this, is that his drumming is kind of stuck back in the seventies (laughs) which is terrific because we've got this wonderful period kind of playing. The songs that have the drum kit on them are both very retro, so his drumming just fitted right in. It couldn't have been better! JC: Was the recording the same with Michael? JS: I went over all the songs with him face to face, played them all, talked about them, and then I left him to it. I let him work them out and they were almost all immaculate. The couple of things that I wanted to change, we changed... easily done. It's an interesting way of working, a cost effective way of working. I was paying for the recording myself so this was quite a consideration. JC: It's interesting because you can just send someone tracks for them to play on without actually having to see them. McLuhan talked about the "global village" concept where technology brings us together: we're more aware of what's going on in other parts of the world and communication is a breeze. On the other hand, people can shop from home these days, online, without ever having to see another human being and we may be in danger of a kind of isolation and displacement there. So, given all that, "is the technology bringing us together or keeping us apart? ", to quote a line from your song. JS: I put it as a question because I'm very ambivalent about it. I think the technology worked very well for this project. If we'd have been crammed into a studio together and doing it live, I don't think we would have got all the little touches and instrumental lines that we got. So I was very happy with cyber-recording for this project, but I'm ambivalent about it in general. JC: The CD sounds great, aurally. You really notice it at the very beginning with the scratchy old Victrola piping away for a few seconds and then going into the actual song. JS: The final sound isn't really down to me. I just try to get the arrangements right, then lay down raw tracks and try to get them OK. I don't have any production pretensions at all. I leave that to guys who know what they're doing. In the case of Curly's Airships it was David Lord. In this case it was Marco Olivotto, which was a very happy connection. JC: Marco put the album out. How did this come about? JS: Marco is a charter member of the Peter Hammill and Van der Graaf Generator Study Group. He's also a musician and he runs a large professional studio in a village outside the northern Italian town of Rovereto. He's a great guy. Anyway, the deal I had with Irregular Records fell through. It was no fault of theirs, nor of mine... it was just a misunderstanding about the basic kind of business model for putting out the record. The news got out on the internet, and I got an email from Marco, who I never heard of, saying "I'd like to put it out on my label, Labor of Love, and I'd be happy to provide production facilities for the mixing." JC: (laughing) It's all your clean living Judge, because things are just falling into place! JS: Yes, exactly! So, Marco sent me some CDs he'd recorded and I was very impressed by the technical quality of the production, and their clarity. I also appreciated the straightforwardness of the contract he was proposing. I thought it was very admirable in fact, so I didn't have too much trouble agreeing to do it even though I'd never met him. I sent all the tracks over to him one instrument at a time. You mix the individual instrumental tracks onto separate tracks of a CD and send them in the post. Then the whole session can be rebuilt on another system. So when I went to Italy they were all there in his massive, Pro-Tools setup and we were able to start mixing. JC: So it's out on his label, Labour of Love. JS: I think it's a good label, it could go far. At the moment it's mostly internet based, but it looks as if my new record will eventually be distributed in the conventional way, and it will be in the shops. JC: There are some tunes on here that were on Dome of Discovery, "Carpet Tiles" and "Tell Me You Love Me". Does this mean that other tunes like "Don't Point That Thing At Me" will be resurrected? JS: Well, not in a keyboard and guitar arrangement. The trouble is that a lot of the Dome of Discovery material relies on having the grand choir sound, and brass, cello, and so on... But those two particular songs have this up-tempo Hungarian feel about them. And that's something that an accordion/guitar duet can manage so beautifully, so I thought "I just have to do them again." JC: The first tune on the new album has a quote: "Rock and Roll, you ruined my life. You're a beautiful mistress but a pig of a wife." That's from 1978. Are you a bit brighter on the subject now? JS: (laughs) I'm considerably brighter on the matter! I'm altogether a more cheerful character now than I was in 1978. That line comes from a chamber opera I wrote called "The Book of Hours" which was performed at the Young Vic Theatre. It was directed by Mel Smith, of all people. It's a bit of a rant about trying to make it in the music business. But, no... I don't feel like that now. I quite like the line, but I certainly don't feel that rock and roll has wrecked my life! It's made my life worthwhile.